The following topic describes all the visual elements and terms used in a standard RadChart control. PlotArea: The area that contains the data series (on the image it is the area inside the rectangle defined by the axes). Series: The visual representation of the data. 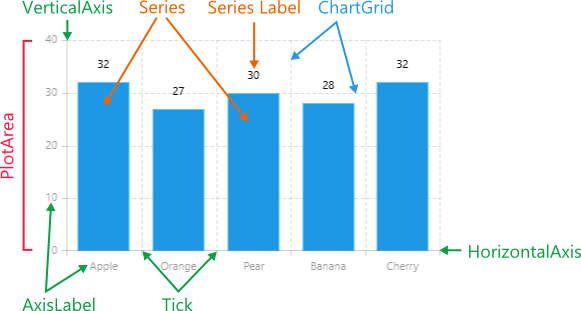 SeriesLabels: Labels that provide specific information about the data points in the series. VerticalAxis/HorizontalAxis: Axes that define the coordinate system used to plot the data. Tick: Marks specific values on the axes. AxisLabel: Labels for specific values on the axes.